Taking your bike up and down stairs is way harder than it should be. After all, it has wheels, right? But since you can’t just ride up to your fifth-floor walkup, you end up hefting that beast. Designer Samantha Del Rosario has a much easier solution. It’s called, simply enough, Lift. 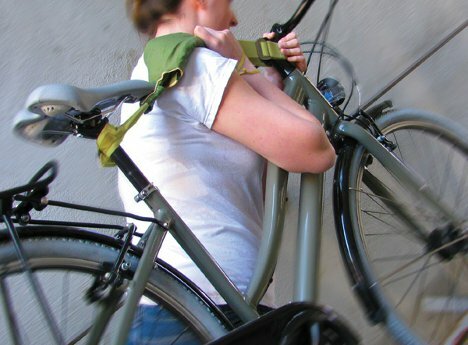 It’s a basic device made of fabric and elastic that attaches to your bike and lets you sling it over your shoulder like a piece of large, heavy luggage. 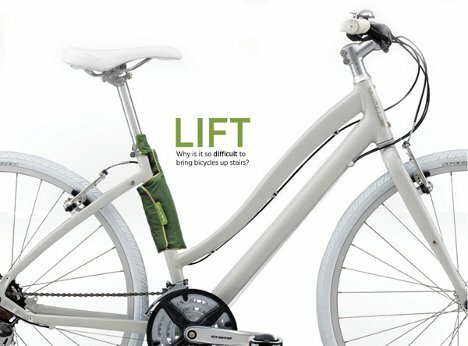 When not in use, the Lift hides away in a convenient little pouch on the bike’s seat post. When you need to transport your bike, the strap wraps around the front post. 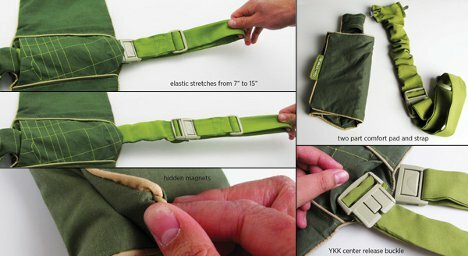 The handy strap then slips easily right over your shoulder. A soft pad keeps the Lift comfy…or as comfy as it can be to have a bike slung over your shoulder like a ridiculously oversize purse. And when you reach your destination, the Lift packs away again in seconds, letting you ride unhindered. See more in Bikes & Cycles or under Transportation. April, 2012.